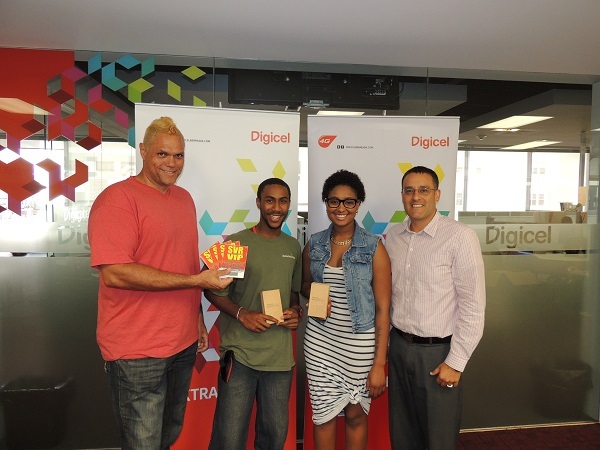 Digicel Bermuda and Soca versus Reggae organisers today [June 22] announced the two lucky winners of their Text To Win promotion – Jayde Gibbons and Adriel Charles. The promotion ran from May 20th through June 10th via social media and saw hundreds of Digicel customers text their guess at this year’s Soca versus Reggae artists. Participants entered the draw for the chance to win one of two Ultra VIP Grand Prizes including a Samsung Galaxy S4 with 6 months free Digicel service. Additionally, the winners will each receive two tickets to Soca versus Reggae with open bar access, catered cuisine, VIP parking and priority access, backstage passes and photo opportunities with the artists courtesy of Soca versus Reggae organisers. “At Digicel we are always looking for exciting ways to engage our customers while supporting community events. We look forward to sponsoring the official Cup Match After Party each year and are happy to share the occasion with two Digicel customers and their guests,” said Shane Mora, Marketing Director of Digicel Bermuda. Soca versus Reggae is scheduled to take place on August 2nd 2013 at Tiger Bay, St. George’s, where former Soca Monarchs Bunji Garlin and Faye-Ann Lyons will lead the defending champion Soca team, while International superstar Demarco will rally the troops for Reggae in what promises to be a truly memorable event. Rounding out the Soca team will be local Deejays Rusty G and DJ Chubb, while King Jyrus and Prezidential Elite will represent Reggae.